In an attempt to improve security, Congress told the Federal Aviation Administration (FAA) in 2004 to come up with a pilot’s license that included the pilot’s photo and could contain biometric information like fingerprints or iris scans. Today, the only pilots pictured on FAA licenses are flight pioneers Wilbur and Orville Wright, and the licenses lack biometric data. In a letter Tuesday, Representative John Mica (R-Florida), asked the heads of the FAA, the Transportation Security Administration (TSA), and DHS to explain why they have not complied with the law he helped write. “It is absolutely astounding that DHS, TSA and FAA could, after six years to implement the act, still achieve such an incredible level of incompetence,” wrote Mica, the top Republican member of the House Transportation and Infrastructure Committee. NPR reports that the Intelligence Reform and Terrorism Prevention Act of 2004 sought to fill some of the security gaps exposed by the 9/11 terrorist attacks, including verifying the identities of people seeking access to airplanes and airfields. Mica said in an interview with NPR that FAA officials have told his staff that one reason the licenses do not contain biometric information is that they have been waiting for TSA and DHS to decide on criteria for the information and the equipment necessary to read the information. He said the three agencies have been pointing fingers at each other. TSA officials declined to comment on the biometric data. “TSA will respond directly to Congressman Mica,” said Sterling Payne, a spokesman for the agency. The law does not say the licenses have to contain biometric data, just that they be capable of doing so. That would require they be embedded with microchips capable of storing fingerprints, iris scans, or personal data that can be used to verify someone’s identification. Lawmakers left it up to the FAA administrator to decide what biometric information should be included. In response to the lawmaker’s letter, FAA spokeswoman Sasha Johnson said the licenses issued now already have the capability to hold biometric information. Mica said that is not what the agency told his staff. Biometric data is increasingly being added to driver’s licenses, passports, and company IDs. NPR reports that immediately after the law was passed, FAA required pilots to carry a government-issued photo ID in addition to their pilot’s license. The agency, however, stopped short of requiring a photo as part of its license. At the time the law was being debated, FAA officials said that unlike state motor vehicles departments, the agency doesn’t have conveniently located offices where pilots can present themselves to have their photos taken. Congress, however, also gave the FAA permission to designate a local authority, such as a police department or an airport, to take the photos. FAA plans to propose a regulation later this year that would require pilot’s licenses to include a photo, Johnson said. Andrew Sullivan, an aviation security expert in Dallas, said that while photos and biometric information would be helpful, their absence does not create a significant safety gap. 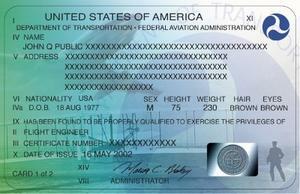 At large airports with scheduled airline service, flight crews are required to show TSA screeners a company photo ID. They also need the identification to board planes or to step out onto the tarmac. The biometric data is only useful if TSA screeners or other officials have equipment capable of reading it, Sullivan noted. NPR notes that airline pilots generally are not asked to show their FAA licenses except by a company when they are being hired or by FAA inspectors during check rides or other skills tests. Commercial and private pilots are occasionally asked for licenses by FAA officials during airfield inspections or by accident investigators. Private pilots are also likely to be asked to present their licenses when joining a flying club or renting a plane.